Lets say the month is leaving with a puketastic bang. puke puke puke. No pictures…. Other then tarping the area and constant laundry things are surprising good. Visit with the sister and her family was good (although pukey) and I found in my BiL a partner in puke clean up. Nothing says love like cleaning up vomit together. Time to get the baby out of the rinse cycle. Happy Thanksgiving to all my American friends. To everyone else, hope you are having a nice Thursday. Right now I have a limited amount of time and I can either blog or nap. Given that Zoe puked all night so I’m on the short side of sleep I’m going to use this time for sleeping. The kid hoard is doing well, Lars is cooking, my pies are already done and all I need to do is decorate a birthday cake and set the table. Ps. congratulations to my mom for completing the writing version of Nablopomo – she wrote 50k words of a book and it is done as of yesterday. I don’t know what is more of an achievement, that or running a marathon. Now she has to tie up the ending (because 50,000 words didn’t quite cover it) and find someone to publish. Maybe there is one or two steps in between but either way, congratulations to mom! Today’s topic is Creative Heroines. Be sure to read to the end of this post to find a list of links to the other carnival participants. 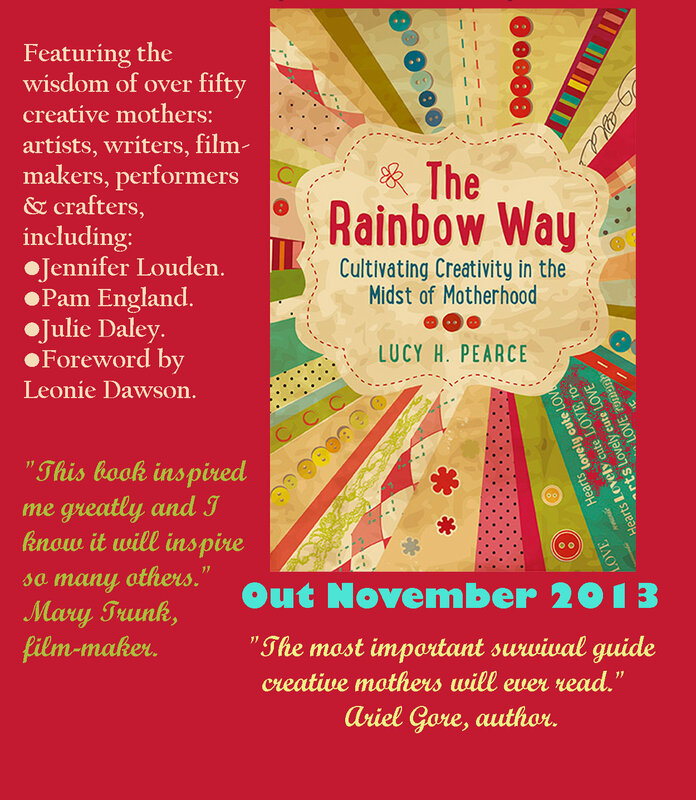 The author of The Rainbow Way put out a fun list of topics for a group of creative people to write about. I came late to the party (I blame the children) so this is my first official post for the carnival, but, my post from last week on Creative Kids was from her list. On the other hand, it does not occur to me that I should put aside crafts and creativity just because I’m a busy adult. Yes, some of my more delicate painting/gold leaf work is packed up indefinitely but I replaced it with quick and satisfying photography. I sew more than ever and while my drawing is more focused on ponies and geometric shapes we draw some time every single day (usually on paper, sometimes on our pajamas or siblings). 1. My Mom. My mom is my first and most persistent example of creativity in the midst of motherhood. She is a highly accomplished needle worker and knitter and is always working on some project in basically every memory of her. maybe every memory but basically no pictures! That is a project in her lap, a crazy cool blue variegated sweater/poncho. We learned early not to mess with active projects on needles or in hoops but we were also allowed to play with fabric and sewing and I had a playschool loom at some very early age. The hum of a sewing machine brings back memories of Mom sewing for this or that while I went to sleep upstairs or played near by. She always allowed for creative mess and we were allowed to rearrange our room any time. I stenciled all over my room and I also painted the ceiling of our front porch with a cool cloud motif. My painting was actively encouraged by my grandparents and the house in Malta was completely stenciled by me at age 12. I think it boils down to the fact that she allowed us to be ourselves by not micromanaging, and, was usually engaged in some sort of creative production. I never did as well with needle work and I’ve knit 3 things ever but I was ferried to and from art lessons, play rehearsals, and I never even wondered if I was ‘allowed’ to take art in college (as an elective**). 2. My Highschool Boyfriend’s Mom Nan. I know it may seem odd to include the mother of a boy I dated at age 16-18ish, but, she did make a real impression. While my mom was 110% into fiber in all its glorious forms (and to her dismay she has no room for sheep or llamas at our house) all tools and building were the solid domain of my father***. I spent plenty of time at my boyfriends house during the years we dated and at the time I was very impressed that his mom had a workroom in the lower level that she built and refinished furniture and various small crafts. Thinking back now that I am a parent, she was probably flitting in and out to be sure we were vaguely chaperoned, but, I remember the building. Her husband is the painter and had his space and she is the ‘everything else’ and it felt like no challenge was too big. I have re-met her through facebook and she seems to still have the building and creativity bug and made her daugher a chicken coup. I have already told her this directly via facebook, but, I credit her with the affirmation that I, as a female, could be in charge of building project (with power tools and everything). My dad let me help plenty but I’m glad I got the message early that I could run the show because Lars, while an engineer, is not a builder of any sort. If I was waiting for him to hang some shelves we would have a lot of things on the floor. 3. All the people who created the ‘girls can do it all campaign’. It was a rude surprise to find out that I honestly could not do ‘it all’ but I am glad that I was given the world as my oyster and not a narrow gender/class/race dictated path to follow. The GirlScouts, the American Girl novels, the majority of my elementary teachers especially Sister Kathleen who was a super can-do woman, an explosion of ‘girl adventure’ novels that ranged from Nancy Drew to the Babysitters club; all these things contributed to the confidence that when I walked into college, work, life knowing what I wanted and that I would do it. Doubt was not part of my fears. It really still is not… I do fear failure but I seldom go into a project wondering if I can do it. This has strayed from creativity but the can-do and do-it-all attitude are some of the important reasons I don’t second guess my desire to build a coat rail or redo a room not to mention sew a pony hoodie or create a Firestar costume. There are times I say “I don’t know how” but very few that I say “I don’t think I can” when it comes to something short of house building and that confidence for creativity is from the society and time I was born into and the people who gave me a good example along the way. **My mom actually wanted me to go to school for art, I said I wanted to make money with my degree. Not sure who one that one since I have a BA and MBA but spend my time right now doing arts and crafts. Sometimes I even get paid for it. ps. This post was prewritten and its a good thing because the day it is published I will be living it up with my sister and her 4 kids at the Mall of America and the best you would have gotten would have been a phone picture. Brush, brush, brush, comb,comb, comb. all girls who like to brush and comb should have a pet like this at home. I’m jumping in the deep end making a 5x recipe for banana bread that I have not tried in the past. Hey, its banana and butter and flour and some other regular stuff that goes into a normal breadie cakie concoction plus I added chocolate chips so that should help. The massive multiplier is because I will have 4 extra kids and 3 of them are boys and if I know one thing about boys is they can EAT. I also had a ton of bananas and then I mentioned I was doing this and a friend piled on her ready to ditch bananas so I had 5.5 cups of mashed banana. this is just the banana and squash part, I needed a really big container for the whole thing. I made regular sized loaf pans, and, mini loaves in the pampered chef stone. 5x yielded 3 regular loaves and 2 rounds of the 4 mini loaves. The outside is crispy/chewy, the inside is moist. The overall taste is not in your face banana but still sweet and a great breakfast bread. It is a fairly low calorie item since it uses low/no fat dairy and no yokes but I’m not sure how the stats change with my addition of squash. I feel full and fine after eating my half for lunch but I’m eyeing Lars’ half too because it tasted so good. The min loafs took 45 min and while the center looked a tiny bit underdone but upon tasting it was fine. 1 hour exactly for the full loaf. half a mini loaf. Lars ate the crust before he knew it was for a picture. Tomorrow is clean all the things and make room for 6 people to sleep!